The 3.5 million fans who bought Fablehaven know the series has many imaginative mythical creatures especially dragons. Every one of the dragons has a name and a special power and they all look different and are described in words, but they existed only in our imagination....UNTIL NOW. 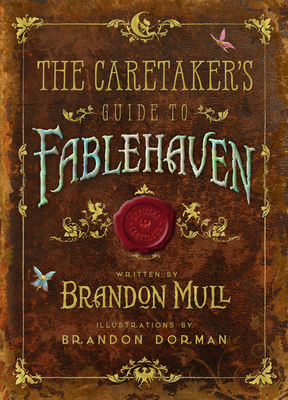 The Caretaker's Guide to Fablehaven is the first visual discovery of the creatures in the series and is written as if the reader is the new caretaker of the Fablehaven preserve. It has all sorts of insider's knowledge the new caretaker of Fablehaven would have to know, such as dragon tears are very powerful in making potions but they are extremely difficult to come by and cruel people have been known to torment young dragons just to collect tears So don't YOU want to be their caretaker? Entries detail important information about artifacts large and small, a complete bestiary of creatures (from fairies to trolls to satyrs), a guide to identifying demons, dragons, and wizards as well as valuable insights into the other magical preserves. Scattered throughout the book are colorful fairies that also mark some of the characters, artifacts, and creatures that will be featured in the upcoming sequel series, Dragonwatch. Brandon Mull has worked as a comedian, a filing clerk, a patio installer, a movie promoter, a copywriter, and briefly as a chicken stacker. For a couple of years, he lived in the Atacama Desert of Northern Chile, where he learned Spanish and juggling. He currently lives in Utah in a happy little valley near the mouth of a canyon with his four children and dog named Buffy. Brandon is the #1 New York Times best-selling author of the Fablehaven, Beyonders, and Five Kingdoms series. Visit Brandon at BrandonMull.com. Brandon Dorman is the illustrator of the New York Times bestseller The Wizard. His work has appeared in childrens books and on numerous covers, including the Fablehaven series and The Candy Shop War series.